Heroes honored with flight to D.C.
As a way of honoring those WWII, Korean, and Vietnam War veterans who served, fought and fell for our country, Honor Flight Tallahassee sponsors a special flight to Washington, D.C. The Honor Flight organization gives veterans who served their country the chance to tour the memorials built in appreciation of their service. 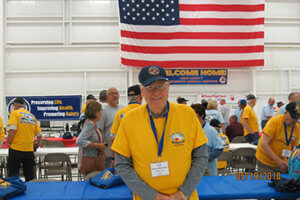 This year’s Honor Flight was Saturday, May 19. The group departed from Tallahassee at 7 a.m. and had a full day of tours around our nation’s capital. Billy Mahaffey, a Marine Corps Veteran, joined this year’s Honor Flight along with Bob (Army), Joe (Air Force) and Virgil (Army) Butler and was able to tour the World War II, Korean, Vietnam, Air Force, Iwo Jima and Lincoln Memorials. They also had the chance to visit Arlington National Cemetery and the Tomb of the Unknowns. They returned to Tallahassee that evening and were greeted with a warm welcome by hundreds of people showing their support and thanking them for their service.